Fiber-optics sensor materials for aerospace applications. 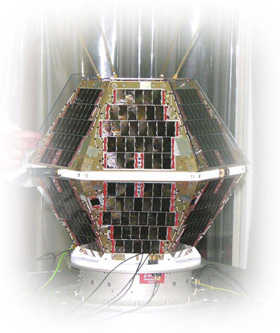 One of the main Projes leaded by INTA was related to the first nanosatellite called NANOSAT-01 launched on board the Ariane 5. The satellite consist on an hexagonal device of less than 19 kg of weight and a diameter of about 50 cm, that describes a LEO orbit of 655 km of altitude. The main objective of the satellite is to probe the operation and performance of micro and nanotechnologies in space environment. One of the scientific experiments implemented on board was the sol-gel based magnetic nanosensor. The magnetic sol-gel nanosensor will be responsible for the positioning and orientation of the satellite by the detection the Earth gravitational magnetic field. The sensor consists on a dispersion of γ-Fe2O3 magnetic nanoparticles in a transparent silica matrix prepared using the sol-gel procedure. This nanocomposite exhibiting the magnetooptical Faraday Effect was implemented as the heart of the magnetic nanosensor. The complementary systems, such as de the detection optics and the electronics required for the operation of the nanosensor, were developed accordingly to the requirements and performance of the sol-gel nanosensor. The design of the nanosensor and the complementary systems should also comply with the strong vibrations imposed by the launch procedures and the harsh space environment conditions. The nanosensor was designed for a 3-6 years lifetime in orbit. M. Zayat, F. del Monte, M.P. Morales, G. Rosa, H. Guerrero, C.J. Serna and D. Levy, Adv. Mater. 2003, 15, 1809. M. Zayat, R. Pardo, G. Rosa, R.P. del Real, M. Diaz-Michelena, I. Arruego, H. Guerrero and D. Levy, J. Sol-Gel Sci. Technol. 2009, 50, 254. M. Fernández-Rodríguez, G. Ramos, F. del Monte, D. Levy, C.G. Alvarado, A. Núñez y A. Álvarez-Herrero, Ellipsometric analysis of gamma radiation effects on standard optical coatings used in aerospace applications, Thin Solid Films, 2004, 455-456, 545-550. A. Alvarez-Herrero, G. Ramos, F. del Monte, E. Bernabeu, y D. Levy, Water adsorption in porous TiO2-SiO2 sol-gel films analyzed by spectroscopic ellipsometric, Thin Solid Films 2004, 455-456, 356-360. A. Alvarez-Herrero, H. Guerrero and D. Levy, High-sensitivity sensor of low relative humidity based on overlay on side-polished fibres, IEEE Sensors Journal, 2004, 4(1), 52-56.